Russian President Vladimir Putin and Chinese President Xi Jinping held talks in Moscow on Tuesday, July 4 as part of the Chinese president's visit to Russia. According to Xi, the cooperation between China and Russia is the "historical choice" of our countries. He also called the bilateral ties a "strategic alliance." He said that it is a "win-win" cooperation, adding that the "China-Russia relations are experiencing their best time in history." Putin said that Xi's visit is one of the most important events this year. "We are committed to joint efforts with Russia to coordinate and cooperate in international affairs and jointly with the international community to take efforts to optimize global management, protect and maintain strategic balance and stability around the world in order to jointly overcome global threats and challenges such as terrorism, jointly stimulate the process of political settlement in hot spots and form a new type of interstate relations on the basis of cooperation and mutual benefit," Xi said after a meeting with Russian President Vladimir Putin. According to Xi, Beijing and Moscow will also enhance coordination within the G20 to promote the global economic growth. Putin said that Chinese and Russian media representatives who are present at the conference are doing their best to cover world events in an unbiased way. In his turn, Xi said that contacts between Russian and Chinese media are increasing. Earlier in the day, Sputnik Editor-in-Chief Margarita Simonyan said that Russian and Chinese media should jointly resist fake news. Putin said that the Korean settlement is Russia's and Chinese foreign policy priority. "The comprehensive solution of the problems of the Korean peninsula is among the joint foreign policy priorities to ensure a lasting peace and stability in northeast Asia," Putin said after talks with the Chinese leader. He added that Russia and China agreed to jointly work to solve the North Korean issue. Moscow and Beijing have agreed to step up promotion of their common initiative with regards to a solution to the North Korean situation following Pyongyang's latest missile launch, Putin said. "We agreed to actively promote our common initiative, based on the Russian gradual plan for Korean settlement and Chinese ideas to simultaneously freeze the North Korean nuclear missile program and large-scale US-South Korean military drills." Earlier in the day, Hwasong-14 ICBM missile was launched from North Korea’s north-western regions near its border with China. It fell into the Sea of Japan within Japan’s 200-mile exclusive economic zone. 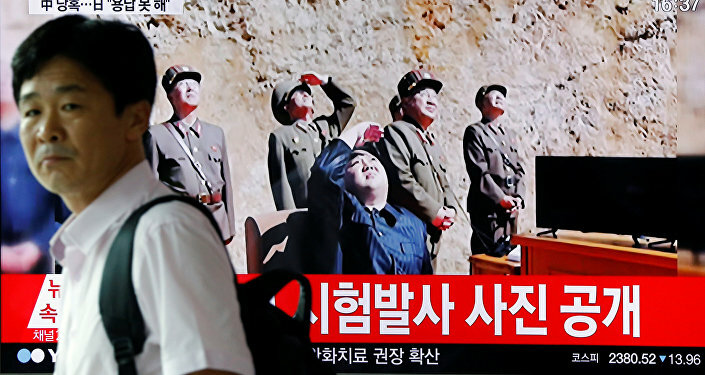 North Korea’s media reported success of the missile test, while governments in Tokyo and Seoul condemned the move as a breach of the United Nations Security Council resolutions. North Korea carried out several missile tests in the past two months, possibly testing a ICBM rocket engine on June 23 and missiles of various ranges on June 08, May 29 and May 21. Over the years, the United Nations Security Council has issued numerous resolutions concerning North Korea. The June 02 resolution condemned nuclear weapons and ballistic missile development activities, while the March 23 resolution strengthened sanctions against Pyongyang.